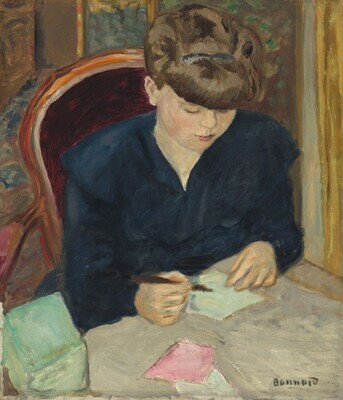 Acquired 1906 from the artist by (Bernheim-Jeune, Paris); sold to Alexandre Natanson [1867-1936], Paris; (his sale, Hôtel Drouot, Paris, 16 May 1929, no. 88); purchased by (Galerie Étienne Bignou, Paris and New York) for Chester Dale [1882-1962];  bequest 1963 to NGA. Jean and Henry Dauberville, Bonnard, Catalogue raisonné de l'oeuvre peint, Paris, 1968, no. 389. Annotated sales catalogue, National Gallery of Art Library. See also Chester Dale papers, copies NGA curatorial files. Renoir and His Tradition, Museum of French Art, New York, 1931, no. 23. Loan Exhibition of Paintings and Prints by Pierre Bonnard and Édouard Vuillard, Art Institute of Chicago, 1938-1939, no. 7, repro. Twentieth Century French Paintings from the Chester Dale Collection, National Gallery of Art, Washington, 1952, no. 11, repro. Fage, André. Le collectionneur de peintures modernes.Paris, 1930: 252. "Maud Dale Presents Renoir and His Tradition at French Museum. "The Art Digest (December 1, 1931): 32, repro. Meier-Graefe, Julius. "Bonnard." The Art News (31December 1938): 8, repro. Paintings from the Chester Dale Collection. Philadelphia, 1943:, color frontispiece. "Best of Dale Collection goes on Display at Gallery Today." The Sunday Star (23 November 1952): A14. "Chester Dale's Collection." Pictures on Exhibit Vol XV, no 3 (December 1952): 11. Twentieth Century French Paintings from the Chester Dale Collection. National Gallery of Art. Washington, 1952 (2nd ed., 1960; rev. ed., 1965): 11, repro. Walker, John. "The Letter." Ladies Home Journal (March 1954): 64, repro. Twentieth Century French Paintings from the Chester Dale Collection. National Gallery of Art, Washington, D.C., 1960 (2nd ed. ): 12, repro. Twentieth Century French Paintings & Sculpture of the French School in the Chester Dale Collection. National Gallery of Art, Washington, 1965 (rev. ed. ): 11, repro. Dauberville, Jean, and Henry Dauberville. Bonnard, Catalogue raisonné de l'oeuvre peint. 4 vols. Paris, 1966-1974: no. 389, repro. Watson, Ross. The National Gallery of Art, Washington. New York, 1979: 128, pl. 115. Walker, John. National Gallery of Art, Washington. Rev. ed. New York, 1984: 576, no. 881, color repro. European Paintings: An Illustrated Catalogue. National Gallery of Art, Washington, 1985: 52, repro. Duffy, Jean. "Bonnard and Josipovici: 'Il ne s'agit pas de peindre la vie, il s'agit de rendre vivante la peinture. '"Word&Image Vol. 9 No.4 (October - December 1993): 289, repro.